Free Licenses of PDF To Excel Converter for Everyone | aeBeta : IT Resources and Reviews , Software Tips and Promotions ! 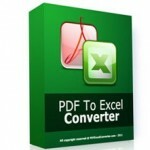 PDFExcelConverter.com today launches the time-limited giveaway of their main product – PDF To Excel Converter. The original price of PDF To Excel Converter is $39.95 USD each license, but all users are able to get the licenses of PDF To Excel Converter before 2012 March 1st for free. Office workers often have to move data from a PDF document to Excel to make it editable. Copying and pasting figures from a large document is a time-consuming and complex process that many users wish they could avoid. PDF To Excel Converter is an easy to use and application that lets users convert PDF documents to Excel (XLS) on Windows platforms. The utility incorporates a powerful engine which produces the most accurate XLS documents 160% faster than any other PDF To Excel conversion software. The usage of PDF To Excel Converter is very simple. Drag and drop your PDF files onto the converter’s file list, and then click on the “Start Converting Now” button. The conversion task will get started immediately. Pdf Convertor : PDF Tiger free for everyone now !